(New Britain, Conn., March 19, 2016) – A new member of the New Britain Bees and the central Connecticut community was introduced on Saturday at the very successful Opening Day of Ticket Sales at New Britain Stadium. "Sting", the official team mascot of the Atlantic League's New Britain Bees, made his way out of the main entrance of the ballpark just as tickets went on sale to the general public at 10:00 a.m. The friendly character was developed by Scollon Productions, who created the Denver Broncos and Carolina Panthers mascots that appeared at Super Bowl 50 this past February. Scollon has also created mascots for international brands including Coca Cola, Disney, Turner Broadcasting and more, as well as other collegiate and professional sports franchises. 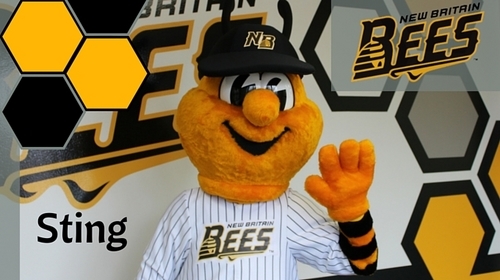 In addition to being omnipresent at all 70 Bees regular season home games, the first ever mascot in New Britain Bees history plans to spend his time out in the community, at schools, little leagues, visiting sick children in hospitals, and visiting friends in and around the central Connecticut region. To request an appearance at your next event, visit NBBees.com and click on “Mascot Appearances” under the Community tab. The New Britain Bees are a member of the Atlantic League of Professional Baseball and will begin their inaugural season of play at New Britain Stadium on April 21 against the York Revolution. For further information or to become a season ticket holder, email info@nbbees.com or call 860-826-BEES (2337). The Atlantic League is the most innovative league in professional baseball and a gateway to Major League Baseball. In the league’s 18-year history, over 34 million fans have attended ALPB games and more than 800 players have joined MLB organizations.The Atlantic League emphasizes winning baseball games, showcases the talent of top-caliber players and offers affordable family entertainment to metropolitan markets serving nearly 15% of the US population. ALPB clubs serve the communities of Bridgeport and New Britain, Conn., Lancaster and York, Pa., Central Islip, N.Y., Bridgewater, N.J., Waldorf, Md., and Sugar Land, Texas.